Most people know that real estate has made more ordinary people wealthy than any other investment vehicle. Real estate is a “multi-dimensional” investment class. This means that you’re paid multiple ways simultaneously. Five, in fact! Let’s briefly explore each of your five with a simple example, and we’ll add up your rates of return to see how much you’re paid at the end of Year One. You’ve carefully purchased a $100,000 rental single-family home where the rent income exceeds the expenses. (Yes, you can find these in the U.S. Midwest and South.) With a 20% down payment, that leaves you with an $80,000 loan. The property is already tenanted. Appreciation. Your property appreciates from $100,000 to $106,000, commensurate with real estate’s historic appreciation rate of 6%. Your $6,000 gain is based on your down payment of just $20,000. That magic of leverage means your return is 30%. Cash Flow. Your rent income minus all the monthly expenses (mortgage, property tax, insurance, property manager, repairs, vacancy, etc.) leaves you with $150 of residual income. That $1,800 divided by your $20,000 down payment is the portion we call the Cash-On-Cash Return. That’s another 9%. Loan Paydown. Unlike your own home where you pay this, your tenant pays the monthly principal portion of your $80,000 loan on this property! At a 5% interest rate on a thirty year mortgage, that’s $1,176 that the tenant pays down for you annually. Divided by your $20,000 of “skin-in-the-game” means that’s another return for you: another 6%. Tax Benefit. We’re talking about both the mortgage interest deduction and something called “depreciation” that you can typically use as a tax write-off against your income. This means you typically don’t even pay tax on all of your rent income. Your return here can be hard to measure because it’s based on your situation, but we’ll conservatively call this investment tailwind another 3%. Inflation-Hedge. This fifth way is one that even some advanced investors fail to consider. Just like inflation erodes the value of your lump of savings, it erodes the weight of your mortgage debt balance just the same. Your $80,000 loan today has its “drag” diluted over time as more & more dollars circulate in an economy. It gets easier to “pay back.” We’ll call this benefit a return of another 3%. You add up your return from the five ways you’re paid, and your Year One return from this income property is a whopping 51%. Let’s note some limitations. We didn’t factor in your buyer mortgage loan closing costs (which the seller can often help pay for you.) If you buy property in a losing job market or hire the wrong property manager, your entire investment could go south. Let’s note some positives as well. In #2 above, your property management cost is considered, meaning that your income is passive. “Passive” means you don’t have to work for it. We’ve also accounted for property hazard insurance, shielding you against some big losses. This is investing. Things not only can go wrong; they will go wrong. The month that you need to spend $500 to replace a fence section won’t feel so great. 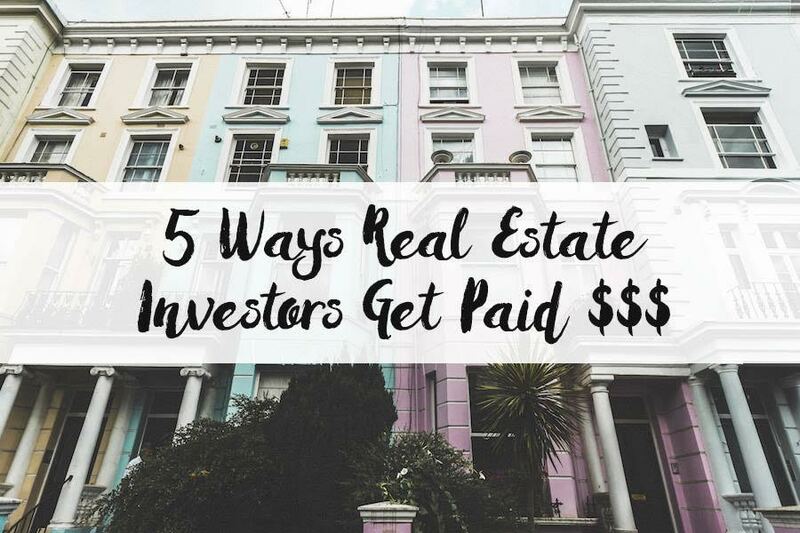 Isn’t it remarkable to finally plainly see all the ways you’re paid as a real estate investor? I talk about this weekly on the Get Rich Education podcast. Even if a lot of things go wrong and half of your 51% return is wiped out, a 25% annual return on investment sounds pretty good to even the most savvy investor. If you understand what’s in this article and put it into practice, it can truly change your life and your family’s life for generations. Most people don’t start in real estate investing because of an emotion: fear. Education dispels fear. Let’s hope this quick dose of education helped dispel some of your fear and gets you on the road to learning more and becoming a successful real estate investor. You genuinely have the ability to build more wealth than you ever thought possible. Thought getting your money to work for you creates wealth? It doesn’t! That’s a myth. My international best-selling E-book is now 100% free, 7 Money Myths That Are Killing Your Wealth Potential. Get it here for a limited time.